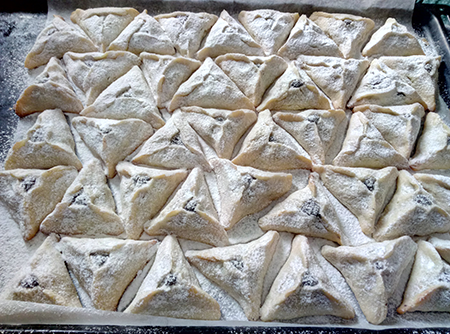 Although I grew up learning that the triangular shape of the iconic Purim cookies, hamantaschen, symbolized the evil Haman’s hat, in Israel, the desserts are called Haman’s Ears (oznei haman). The treats here are made with a shortbread dough, sweeter and crisper than what I remember eating as a child in New England. These pastries in Israel come stuffed with classics like poppy seed—though surprisingly not jam, which has little traction in Israeli bakeries. Beloved Israeli flavors such as halva spread and hazelnut nougat are ubiquitous. 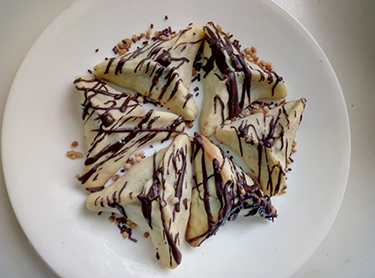 And growing in popularity are chocolate spread-filled centers; the soft spread solidifies during cooking, ultimately resembling a Hershey Kiss hiding within a shortbread surface. As is the case with sufganiyot on Hanukkah, oznei haman have become a “thing” to watch for each year. 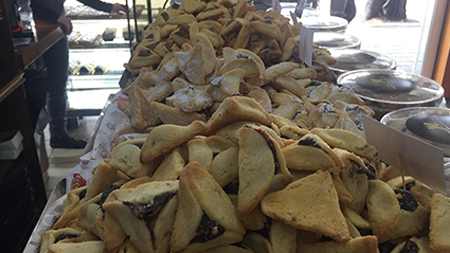 Bakeries strategically release campaigns to promote a new year’s special flavors, and commuters stop in to try a different kind each day in the month leading up to Purim, which this year starts on February 28. In Haifa, Shany Bakery’s flagship location retains its mom-and-pop charm, thanks both to its vintage tables and chairs from 1964 and its wickedly tempting Hungarian- and Israeli-influenced pastries. Ziv Abramovich manages the flagship, while his father, Arieh Abramovich, has served as Shany’s head pastry chef for more than 40 years. Sarah Abramovich, Ziv’s mother and wife to Arieh, rings up customers at the register while in the background, the sound of trucks passing on the busy road leading to Haifa’s industrial port blends with the whir of foaming milk at the espresso machine. This familiar song and dance starts at day break each morning, only to end in the early evening hours. Dedication like that shown by the Abramoviches, who have owned Shany’s for more than 40 years, should be celebrated: In Haifa, at least, there is still a draw for family-run businesses. As a first stop, I like bringing guests on my food tours to Shany’s. I feel good supporting them, and it is important to do so in a quickly gentrifying area. The bakery has just launched this year’s specialty flavors of oznei haman. Full trays of chocolate-coconut, mocha, double chocolate and molten chocolate cake varieties grace the bakery’s counter. Stopping in to watch the action gets my heart racing. Any excuse to be around holiday baking! From my days working in a bakery, I know that holiday periods shift the heartbeat of a bakery and bring employees together to produce a large amount of one significant treat. Shany’s perfect little cookies draw new crowds as well as old, and remind us all about the festival to come. *Makes enough filling for one batch of cookies, and is best when piped into cookies using a piping bag WITHOUT a fitted tip. This year let chocolate spread be the jumping-off point for creating sublimely chocolatey oznei haman. Based on hazelnut butter and cocoa, Nutella doesn’t pool like a chocolate filling made from melted chocolate might and is a neutral base to support a variety of flavor pairings. Here are a few classic combinations that are a snap to pull together. Choose your favorite, or split the recipe and make smaller batches of cookies with these flavor variations. Make dough: In a medium bowl, combine flour, salt and baking powder. Set aside until needed. In a mixer, combine powdered sugar and butter until well incorporated. Add egg yolks one at a time, orange juice and vanilla, and mix for 2-3 minutes until smooth. Add the flour mixture and lemon zest to the mixer, and mix until a uniform dough comes together. Let chill in the refrigerator 2 hours. Form and bake the cookies: After 2 hours, remove dough from fridge and, on a lightly floured surface, roll out a circle of about 1/8-inch thickness. 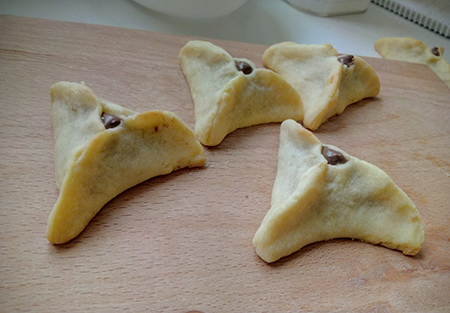 Cut round shapes from the dough using a cookie cutter or glass. place one teaspoon of filling in the center of each circle, and using both hands, push three sides up towards the center to form a triangular shape. Pinch tightly together at each seam. Place formed cookies on a tray small enough to fit into your fridge. Cookies can be kept in tiers, separated by baking paper. Chill cookies for 30-40 minutes. Preheat oven to 350. Bake cookies for 10-12 minutes, or until golden along the edges. Remove from oven, let cool, and enjoy. A cold cookie dough is less likely to open up in the oven: To help maintain the shape of your oznei haman throughout the baking process, place the tray of triangle-shaped cookies in the fridge to firm up for 30-40 minutes prior to baking. Less is more: Don’t over fill, or assembly will become a mess and fillings could run from the cookies during baking. ballls for this Passover. Thank you. I’m sorry to hear that the recipe didn’t work out for you. I personally tested it with good results before adding it to the article. A dry crumbly dough would most likely come from adding too much flour. Since this recipe is adapted from a professional bakery recipe, I think accuracy in measuring is really important here. Always make sure your flour is fluffed up (You can do so with your hand before baking), and gently scooped into the measuring cup, instead of packed tight.